F-16 models are denoted by sequential block numbers to denote significant upgrades. The blocks cover both single and two-seater versions. An intricate Multinational Staged Improvement Program was instituted to gradually upgrade the F-16 and retroactively implement the upgrades in delivered aircraft. The F-16 A/B was initially equipped with the Westinghouse AN/APG-66 Pulse-doppler radar, Pratt & Whitney F100-PW-200 turbofan, rated at 14,670 lbf (64.9 kN), 23,830 lbf (106.0 kN) with afterburner. The USAF bought 674 F-16A's and 121 F-16B's, with delivery completed in March 1985. Early blocks (Block 1/5/10) with relatively minor differences between each. Most were later upgraded to the Block 10 configuration in the early 80's. There were 94 Block 1, 197 Block 5, and 312 Block 10 aircraft produced. Block 1 is the early production model with the nose cone painted black. It was discovered that the black nose cone became an obvious visual identification cue at long range for the Block 1 aircraft, so the color of the nose cone was consequently changed to the low visibility grey for Block 5 aircraft. During the operation of F-16 Block 1, it was discovered that rain water could accumulate in certain spots within the fuselage, so drainage holes were drilled in the forward fuselage and tail fin area for Block 5 aircraft. The Soviet Union significantly reduced the export of titanium during the late 1970's, so manufacturers of the F-16 used aluminium instead. New methods were also used: the corrugated aluminium is bolted to the epoxy surface for Block 10 aircraft, replacing the old method of aluminium honeycomb being glued to the epoxy surface used in earlier aircraft. The first major change in the F-16, the Block 15 aircraft featured larger horizontal stabilizers, the addition of two hardpoints to the chin inlet, improved AN/APG-66 radar, increased capacity of underwing hardpoints. The F-16 gained the Have Quick II secure UHF radio. To counter the additional weight of the new hardpoints, the horizontal stabilizers were enlarged by 30%. Block 15 is the most numerous variant of the F-16, with 983 produced. The last one was delivered in 1996 to Thailand. From 1987 Block 15 aircraft were delivered to the Operational Capability Upgrade (OCU) standard, which featured improved F100-PW-220 turbofans with digital control interface, the ability to fire the AGM-65, AMRAAM, and AGM-119 Penguin missiles, countermeasures and cockpit upgrades, improved computers and data bus. Its maximum takeoff weight increased to 37,500 lb (17,000 kg). 214 aircraft received this upgrade, as well as some Block 10 aircraft, retroactively. 150 Block 15 OCU's for Taiwan with the addition of most of the F-16 C/D capability: carriage of AGM-45 Shrike, AGM-84 Harpoon, AGM-88 HARM, and the LANTIRN pod. The computers onboard Block 20 is siginificantly improved in comparison to that of the earlier versions, with the overall processing speed increased 740 times and the overall memory storage increased 180 times in comparison to that of Block 15 OCU. The Block 25 F-16C first flew in June 1984 and entered USAF service in September. The aircraft are fitted with the Westinghouse AN/APG-68 radar, have a precision night attack capability and are fitted with the Pratt & Whitney F100-PW-220E turbofan, with digital control interface. The USAF is the sole user of this variant, with 209 models delivered. The first aircraft subject to the Alternative Fighter Engine project under which aircraft could be fitted with the traditional Pratt & Whitney engines or for the first time the General Electric F110. Blocks ending in 0 are powered by GE, blocks ending in 2 are fitted with Pratt & Whitney engines. The first Block 30 F-16 entered service in 1987. Major differences include the carriage of the AGM-45 Shrike and AGM-88 HARM missiles. From Block 30D aircraft were fitted with enlarged inlets for the increased thrust GE engine, Block 32s were not modified in this way. 733 were produced and delivered to six countries. The block 32H/J aircraft currently assigned to the USAF Thunderbird (squadron) flight demonstration squadron were built in 1986 & 1987 and are some of the oldest operational F-16's in the Air Force. Entering service in 1988, the Block 40/42 is the improved all-day/all-weather strike variant with LANTIRN pod, the night capability gives rise to the name "Night Falcons". The block features strengthened and lengthened undercarriage for LANTIRN pods, improved radar, and a GPS receiver. From 2002 the Block 40/42 increases the weapon range available to the aircraft including JDAM, JSOW, WCMD and the (Enhanced) EGBU-27. Also incorporated in this block was the addition of ANVIS compatible lighting systems. The TCTO (Time Compliance Technical Order) that added the NVIS compatible systems was completed in 2004. 615 aircraft were delivered to 5 countries. Block 50/52 was first delivered in late 1991, the aircraft are equipped with improved GPS/INS. The aircraft can carry a further batch of advanced missiles; the AGM-88 HARM missile, JDAM, JSOW and WCMD. Block 50 aircraft are powered by the F110-GE-129 while the Block 52 jets use the F100-PW-229. Ordered by Polish Air Force. These aircraft are fitted with the latest avionics (including the ALE-50 Towed Decoy System) and provisions for Conformal Fuel Tanks (CFTs). The Greek Air Force ordered this version with the CFTs. All two-seat "Plus" airframes include the enlarged Avionics Dorsal Spine which adds 30 cubic feet (850 L) to the airframe for more avionics with only small increases in weight and drag. This version is sometimes called F-16U and is the foundation of F-16 E/F Block 60. Block 50/52 Plus for Israeli Defense Force - Air Force, with significant Israeli avionics replacing that of American firms (Such as Israeli Aerial Towed Decoy replacing the ALE-50). The addition of Israeli built autonomous aerial combat maneuvering instrumentation systems enables the training exercises to be conducted without the dependence on the ground instrumentation systems, and the helmet mounted sight is also a standard equipment. The F-16I also has the Israeli built removable conformal fuel tanks added. The Common Configuration Implementation Program seeks to standardise all Block 40/42/50/52 F-16s to 50/52 configuration for simplified training and maintenance. The $2 billion program was initiated in September 2001. In addition, the CCIP will incorporate a Link-16 capability with the MIDS for data-sharing with allied aircraft, and the Joint Helmet Mounted Cueing System (JHMCS) for helmet-slaved aiming of the AIM-9X. Based on the F-16C/D, it features conformal fuel tanks and improved radar and avionics; it has only been sold to the United Arab Emirates. The General Electric F110-132 is a development of the -129 model and is rated at 32,500 lbf (144 kN). A major difference from previous Blocks is the Northrop Grumman AN/APG-80 Active Electronically Scanned Array (AESA) radar. Block 60 allows the carriage of all Block 50/52 aircraft-compatible weaponry as well as ASRAAM and the AGM-84E Standoff Land Attack Missile (SLAM). The CFTs provide an additional 450 US gallons (2,045 litres) of fuel allowing increased range or time on station. This has the added benefit of freeing up hardpoints for weapons, i.e. hardpoints that would have been occupied by underwing fuel tanks. The MIL-STD-1553 data bus is replaced by MIL-STD-1773 fiber optic data bus which offers 1000 times increase in data handling capability. 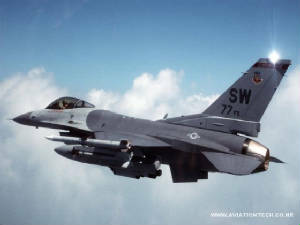 Theoretically, the aircraft could be purchased by the United States Air Force, but in practice the USAF has shown little interest in acquiring new F-16s given that it has an extensive "boneyard" fleet of the planes at the Aerospace Maintenance and Regeneration Center and is planning to take delivery of the new F-35 Joint Strike Fighter by the end of the decade. A single-seat version of the F-16XL was to be designated F-16E, with the twin-seat variant designated F-16F. This was sidelined by the Air Force's selection of the F-15E Strike Eagle in the 1980s Enhanced Tactical Fighter flyoff. F-16/79 - Modified export-version F-16A designed for use with the outdated J79 turbojet engine in answer to President Jimmy Carter's directive to curtail arms proliferation by selling only reduced capability weapons. However, numerous exceptions were made, and with the later relaxation of the policy under President Carter and cancellation under President Ronald Reagan, no copies were ultimately sold. F-16/101 - Modified F-16A designed for use with the General Electric F101 turbofan engine from the B-1A program. GE attempted to rework the engine for fighter usage, but it was never adopted for the F-16. Data from the F-16/101 assisted in the development of the F110 turbofan. F-16ADF - upgraded Block 15 for United States Air National Guard's fighter interception mission (hence the name Air Defense Fighter). Begun in 1989, 270 airframes were upgraded. Avionics were upgraded (including the addition of an IFF interrogator with "bird slicing" IFF antennas), and a spotlight fitted forward and below the cockpit, for night time identification. This was the only US version equipped with the AIM-7 Sparrow air-to-air missile. Beginning in 1994 these aircraft began to be replaced by newer F-16C variants. By 2005 only the North Dakota ANG was flying this example. F-16AM - upgraded single-seat fighter version of the F-16A. The F-16AM is in use with the Belgian Air Force, Portuguese Air Force, Royal Danish Air Force, Royal Netherlands Air Force and the Royal Norwegian Air Force. F-16A(R) - A few F-16As of the Royal Netherlands Air Force were equipped with tactical reconnaissance pods. The aircraft were given the designation F-16A(R). F-16BM - upgraded two-seat training version of the F-16B. The F-16BM is in use with the Belgian Air Force, Portuguese Air Force, Royal Danish Air Force, Royal Netherlands Air Force and the Royal Norwegian Air Force. F-2A/B(FS-X) - Indigenous F-16 inspired design produced in Japan by Mitsubishi Heavy Industries, with cooperation from Lockheed Martin. It is larger and utilizes mainly Japanese avionics. F-16XL - a delta-wing version used by NASA for aeronautical research, once conceived of as a possible competitor for the Enhanced Tactical Fighter program, later won by the F-15E. If the F-16XL had gone into production, it would have been designated F-16E/F (single/twin seat). Two examples were built, one single seat and one two-seat version. RF-16C/F-16R - reconnaissance version that carries the ATARS package. F-16N - 22 Block 30 aircraft delivered to the U.S. Navy for use as aggressor trainers. These aircraft were delivered in 1987-1988. VF-126 and The Navy Fighter Weapons School operated them at NAS Miramar. East coast squadrons were VF-43 at NAS Oceana and VF-45 at NAS Key West. Each squadron had one TF-16N and 5 F-16N, with the exception of NFWS which had 7. Due to the high stress of constant combat training the wings of these aircraft began to crack and the Navy announced their retirement in 1994 and they were sent to AMARC by 1995. As adversary aircraft they were notable for their colorful appearance. Most F-16Ns were painted in a three-tone blue and gray "ghost" scheme. Top Gun had some of the more colorful ones: a three-color desert scheme, a light blue one and a green splinter camo version with Marine markings. VF-126 also had a unique blue example. In 2002 the Navy began to receive 14 F-16 A and B models from AMARC, once again for adversary training and painted in exotic schemes. TF-16N - Four two-seaters delivered to the U.S. Navy for use as aggressor trainers. Each of the four Navy F-16 adversary squadrons had one example of this version. KF-16 - 235 aircraft built by Korean Aerospace Industries under license from Lockheed Martin in the 1990's. There are two variants of KF-16; the first 12 KF-16s were delivered to Republic of Korea Air Force in 1994, and were based on F-16 C/D Block 32. The second variants, introduced in 1994, were advanced derivatives of F-16 C/D Block 52. Almost 2,500 parts were changed from the original F-16C/D. The indigenous T-50/A-50 is based on F-16 techonolgy. F-16 VISTA / MATV / NF-16D - Lockheed-Martin's experimental F-16 with thrust vector control. The VISTA program is considered as successful but the thrust vector control (TVC) never made it into fighter versions. In addition, the British HS.1202-9 design from 1977 bears a striking resemblance to a twin-tailed F-16.